British Prime Minister Theresa May has responded to Wednesday's "sick and depraved" terrorist attack on the the streets of London. Ms May said the location of the attack was not an accident but was instead intended to "strike at the heart of our city". She confirmed that a single attacker drove a car into pedestrians walking on Westminster Bridge, killing two of them, before running with a knife through the front gates of the Palace of Westminster, where he killed a police officer before being shot dead. She vowed that "the forces of evil" would never be allowed "to drive us apart". 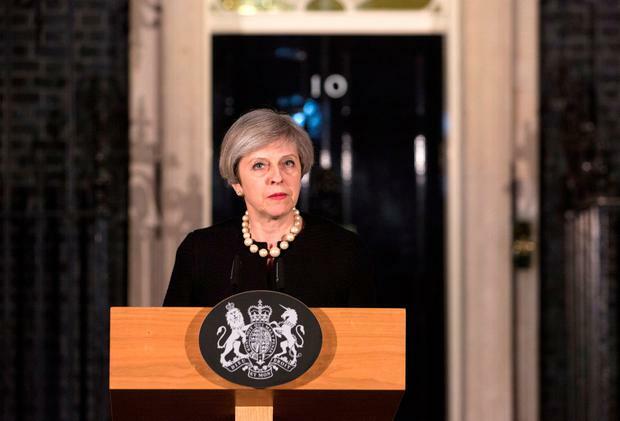 Speaking outside Number 10 Downing Street Ms May said the UK threat level is at 'severe', "and this will not change for some time". "Our thoughts and prayers go out to all who have been affected - to the victims themselves and their family and friends who waved their loved ones off but will not now be welcoming them home." Ms May praised police and emergency responders who ran towards the danger "even as they encouraged others to move the other way". "That they have lost one of their own in today's attack only makes their calmness and professionalism under pressure all the more remarkable." She said that any attempt to defeat the values of parliament "through violence and terror are doomed to fail". She said parliament will meet as normal. "They will live their lives and we will all move forward together, never giving in to terror". Government's emergency Cobra committee to discuss the immediate response to the bloody incident at the Palace of Westminster. The 45-minute meeting brought together senior ministers as well as senior police officers, representatives of the security agencies and London Mayor Sadiq Khan. Mrs May ordered flags to be lowered to half mast over Downing Street as a mark of respect to the innocent people who lost their lives at Westminster. Among ministers attending this evening's meeting were Defence Secretary Sir Michael Fallon, security minister Ben Wallace, Transport Secretary Chris Grayling, Health Secretary Jeremy Hunt and foreign minister Sir Alan Duncan. Absent were Home Secretary Amber Rudd, who was away on an official trip to Pakistan, and Foreign Secretary Boris Johnson, in the US for a summit of nations involved in the fight against the Islamic State terror group. The meeting in Whitehall was addressed by Metropolitan Police Assistant Commissioner Mark Rowley, Britain's most senior anti-terrorist police officer.